There is currently a controversy in the Republic of Ireland about the use of “Isolation Rooms” to manage pupils with Autism. Warning: both links could be extremely upsetting to any parent or person with ASD. I couldn’t listen through to the end. I use inverted commas because inclusion in these cases is recalcitrant at best and not supported by appropriate training or resources. And what is considered “misbehaviour” in these cases is very much a case of interpretation. Let me explain: those of us who prescribe to the science of behavior analysis believe that all behavior has a function. The function can be sensory: such as eating to satiate hunger or going to the toilet to relieve our bladder/bowels, or having a coffee or cigarette to feel alert or relaxed. The function can also be communication; and for people with a communication delay or disability, such as Autism – what starts out as sensory can often become communication based on what happened next. For example, a pupil with ASD could be attending a mainstream classroom where they are able to follow the national curriculum with support. However, due to their autism they may experience a sensation of numbness or ‘pins and needles’ if you like when they are required to sit still for too long. The pupil may have been given a written task to complete but instead of picking up their pencil, they begin flapping their arms or twirling the pencil or perhaps rocking back in their chair. This is an attempt to self-regulate the imbalance they are experiencing internally. WE ALL DO THIS ! next time you are on a long haul flight or in a cinema which has just shown a 3 hour movie, watch the other passengers or patrons as they stand up to leave. There will be leg shaking, stomping and stretching. For some autistic people, this is how they feel all the time. However, to the inexperienced observer, the child may appear to be deliberately disruptive or disobedient. Telling them to stop does not assuage the need to balance the sensation, but it could draw attention to the activity which may allow them to delay starting the task, or embarrass them in front of the class. If they can’t stop, and if they have an internal need to do this it is very hard to stop, then they get told off again and perhaps forced to stop. What happens next can be crucial as this is when the sensory becomes a communicative behavior. If the pupil who is already stressed and in need of sensory regulation feels threatened by being stopped, they can hit out and suddenly go from being “disruptive” to being “aggressive.” If they make contact with another pupil or member of staff, it is quite natural for fear to overcome good judgement, nobody wants to get hurt. So the offending pupil is then removed from the classroom. Whatever the motivation for removing them, the result as you would have heard in the radio item is a feeling of punishment. Punishment for something they just couldn’t help. If the behavior continues, the school might decide to apply for a capital grant to convert an old storage area or bathroom into an isolation room where offending pupils can be sent and held against their will for hours at a time. This is currently happening in schools across Ireland. Imagine instead that the school decides to bring in a Behaviour Analyst. For a fraction of the cost of building an isolation room, they bring in someone with a masters degree in behavioural science to do what is known as a Functional Analysis. This is an observation over a long period where all the stake holders in the situation are asked to fill in data on what is happening, where it is happening, what happened before and what happened after. It is really really important to get a qualified outsider in to help with this as their observations will be impartial. You can’t do this yourself when you are part of the situation. Inappropriate behaviours can be described as an Iceberg with the reason in the 85% below the surface. The people on the Titanic were not capable of analysing the iceberg when they were up to their necks in icy cold water. The kind of information the BT will look for is really easy to collect through observation without stopwatches or graphs. B stands for Behaviour. Describe in detail the topography of the person’s actions. C stands for Consequence. Exactly what happened straight after. 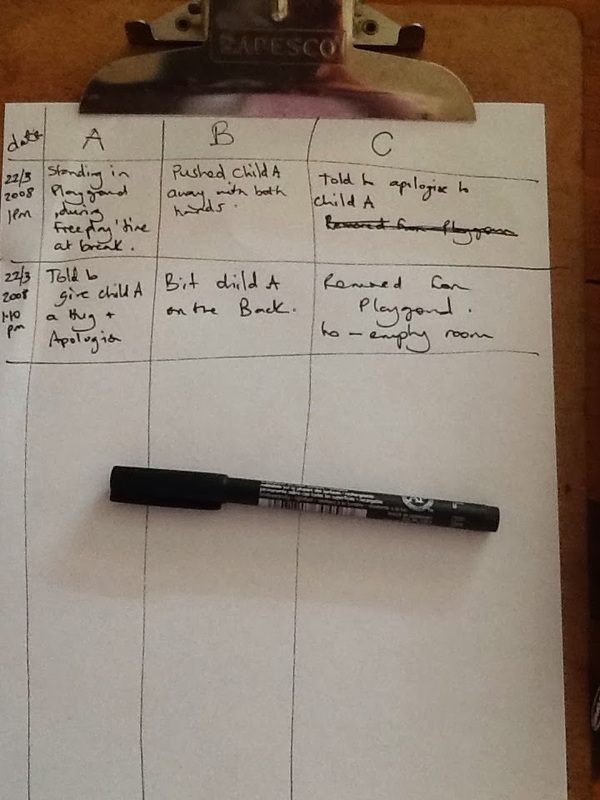 In my experience (and I have used this method many many times) by the time you have completed one side of an A4 page ACCURATELY, you have a pretty good idea of what is going on with the behaviour. ACCURATELY meaning that the antecedent column does not say “no reason” and all parties are honest about the action they took following the observed behaviour. I have had to write “yelled and smacked” in the C column before. I wasn’t proud of it but it helped me understand that smacking and yelling had absolutely no effect on the behaviour. Once you have an idea of the function of a particular behaviour, then you have a chance to replace it with something that is a lot more appropriate to a classroom setting. The Behaviour therapist can make reccommendations which may involve the imput of an occupational therapist or speech and language therapist. They will also take into account the setting and what suits the classroom. It is all about the environment. As someone who works in communication so I would often advise an alternative means to express a need for a movement break, or asking for help with a task. Even when a pupil is considered highly verbal they can feel very uncomfortable communicating in a large classroom. Well that’s how it can feel to have autism and in need of help. Sometimes accidentally pushing someone and being let out of the class can seem easier, which is why they might do it again. It is really easy to accommodate this with visual strategies. These can be written contracts with a schedule of token reinforcement, visual schedules and/or something as simple as a set of break cards. These solutions cost no more than the paper and ink used to create them. Compare that to building a room where a pupil will be imprisoned for long periods of time. By teaching our teachers the skills to manage and improve behaviours with the use of positive reinforcement rather than punishments, all pupils would benefit. The entire teaching environment becomes calmer as everyone is motivated to achieve the rewards, rather than avoid punishment. The observation, measurement and development of these strategies have to be individual. Autism is a spectrum disorder with thousands of variations so what works for one pupil may have the opposite affect on another. I was asked to advise staff in a school in Australia where a pupil was using his toilet breaks to splash water around the school bathroom resulting in a dangerous slip zone. The staff had been restricting access to the toilet (with distressing results) but I suggested they try the opposite; Set up a specific water play area in a safe spot and allow the pupil to work for access. Instead of disrupting he became super compliant in order to earn more chances to play in the water zone. Another pupil might HATE water play. You have to observe and adapt accordingly. Another autistic child in the school was refusing to follow creative writing tasks as set by the teacher and instead engaged in obsessive scripting about a computer game that he played at home. I suggested the teacher learn about the game and look up examples of fanzines and online fan fiction. The pupil was then set writing tasks based on this which incorporated the spelling and grammar goals in the curriculum, but engaged their interest. Once a month he would be allowed into the Principals office (under supervision) to upload his own story on to the site and then share it at assembly. In another class, parents of typical pupils had reported that their children were finding the setting distressful as the teacher was “always yelling at X” – a child with autism. The situation was becoming intolerable for all concerned with pressure to remove the child and return them to a special school where they would not access the national curriculum. It was reported that not only was the entire class calmer and happier as the teacher had stopped yelling, but it was also more efficient as everyone worked to tidy up materials or complete tasks in order to earn reward tokens and get their lolly pop on Friday. You can imagine all those kids walking out into the main school yard on a Friday afternoon brandishing their lollypops proudly to pupils from other classes. Rewards motivate everyone. In other words, by introducing the use of simple evidence based positive behaviour support techniques for one pupil, the benefits had extended to the entire class. And nobody was complaining to the Principal anymore. So rather than spending €12,000 on capital building to create an isolation space, a fraction of that investment in people had resulted in Universal Improvements in Learning for everyone. But the cost benefit is more than monetary. A parent’s peace of mind and a pupil’s right to an education had been saved. And since it was the teacher’s who had called me in, it made their job a lot more satisfying and enjoyable. A blood curdling scream and then CRASH! A broom flies across the room! Next a chair topples over. Flying books!